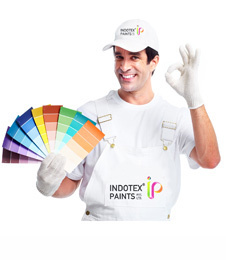 INDOTEX PAINTS PVT. LTD. (Formerly known as Associated Paints & Polymers Industries And Associated Coating Industries) came to existence with the sole goal to be a provider of Quality and Durable products based on latest available technology to enhance the satisfaction of our clientele. We strive hard to provide large range of products & pricing so as to match every budget. We work towards enhancing our clientele’s experience by catering to their paint, coating, texture & ancillary need that they may come across. We are one of the leading paint manufacturing units in the state of Gujarat, Situated at Santej, near Ahmedabad and in operation since 1984. We have our presence in 6 Indian states namely Guarat, Maharashtra, Andhra Pradesh, Goa, Madhya Pradesh and Karnataka and Expanding. Since our inception in 1984, we have emerged as a leading manufacturer of paints and other coatings, formulated to protect against every possible environmental & atmospheric corrosion. Our Experience, Dedication and commitment to satisfy our clients with quality products has made us one of the reputed names in the field of Exterior & Interior Decorative Water Base Acrylic Paints, Oil Base Paints, Textures, High Performance Industrial Coatings & Ancillaries. We continuously strive in the development of Quality & Durable Products. Our Hi-Tech Modern Quality control laboratory ensures that.